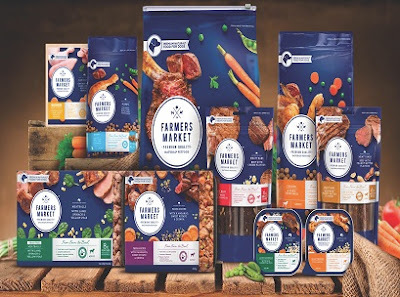 Farmers Market is a new brand of grain-free dog food available at both Coles and Woolworths supermarkets nationally. It is manufactured by the Real Petfood Company who also manufacture brands you may be more familiar with, like VIP Petfoods and Nature's Gift. The Farmers Market products are cleverly positioned to appeal to the growing number of discerning dog owners, who are prepared to spend a little bit more to deliver quality natural ingredients to their pets. Their brand promise to dog owners is to deliver “Real food, real flavour / From farm to bowl™” i.e. a complete and balanced nutrition, free from artificial colours, flavours and preservatives. The addition of prebiotic Inulin is deemed to assist with healthy digestion. For the Meatballs range, the food is gently steamed to preserve essential nutrients then packaged in individual pouches (120g) for convenience and sold in packs of eight. 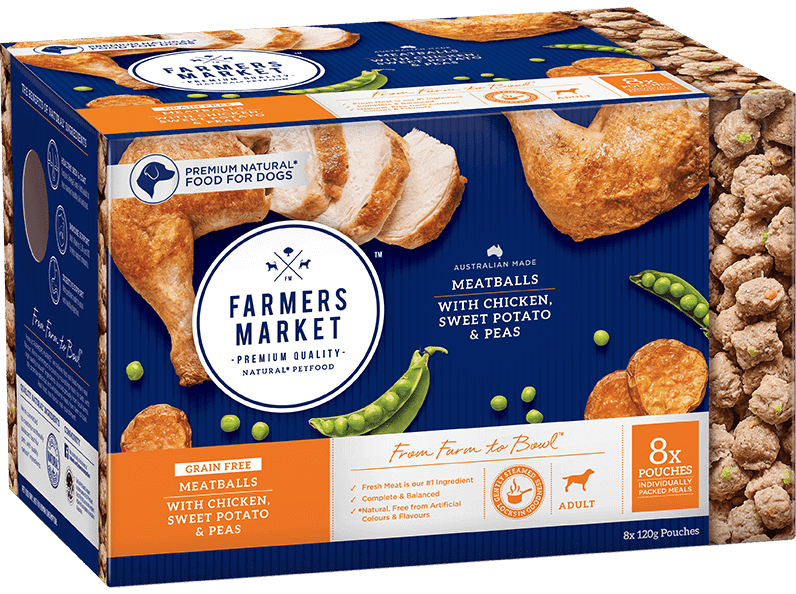 Meatballs with Chicken, Sweet Potato & Peas – Adult dogs – combining fresh chicken, sweet potatoes and crisp green peas. Meatballs with Lamb, Spinach & Yellow Peas – Adult dogs – A tasty combination of fresh lamb, spinach and young yellow peas. The actual percentage of crude protein is only 15% and the daily feeding guide certainly did raise a few eyebrows here... Of course, as with all pet foods, the amount you feed will vary depending on your dog's age, breed and activity levels. The Farmers Market range also encompasses dry food (2.7kg to 6.8kg), wet food (100g varieties) and a range of fresh recipes (300g) from the chilled pet food aisle. RRP: $8.00 (8 x 120g) for the Meatballs range at Coles or Woolworths.